My meetings in Japan were finished in surprisingly short order so there was a little bit of time for some recreational traveling. On Saturday the interpreter was kind enough to take my coworkers and me to the town of Nikko which was about 100k from where I was working. The town of Nikko itself doesn't look too unusual. Just driving through it, one could easily mistake it for an ordinary small town in Japan. It's when you get past the ordinary business district and residential areas that you begin to understand why this is considered a popular tourist destination. Nikko was established as a religious center in the 8th century by a Buddhist priest. Buddhist temples and Shinto shrines (which predated the arrival of Buddhism in the area) were built here, over the course of many years, making it a somewhat significant location. Nikko's current fame is mostly due to more recent events. In 1616 Shogun Ieyasu Tokugawa, the great unifier of Japan, died and his remains were brought to Nikko and placed in a small shrine. Several years later, his grandson had the shrine rebuilt into an incredibly opulent display. This bridge is one of the first things in Nikko that shows any sign of its significance. 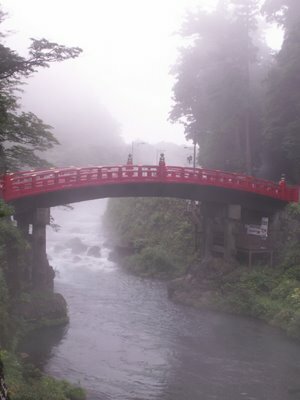 This sacred bridge, also known as the 'snake bridge' is tied to one of the local legends. 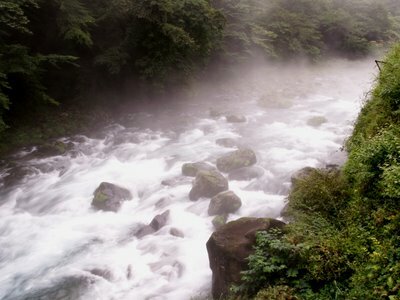 As the story goes, Shodo Shonin, the Buddhist priest mentioned above, was unable to cross the river on his mission to climb Mt. 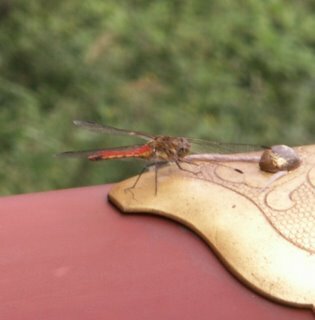 Nantai. The god Jinjao appeared and cast down a pair of magic serpents which formed a bridge. I don't know much about magic snakes, but there is definitely a bridge there. When seen close up, it's apparent that the bridge is in better condition than one might expect for a couple of ancient snakes. There's a very good reason for that, or rather 800,000,000 little reasons. A project costing 800 million yen (~60-70 million US$) and lasting from 1997 to 2005 restored this bridge to it's former glory. 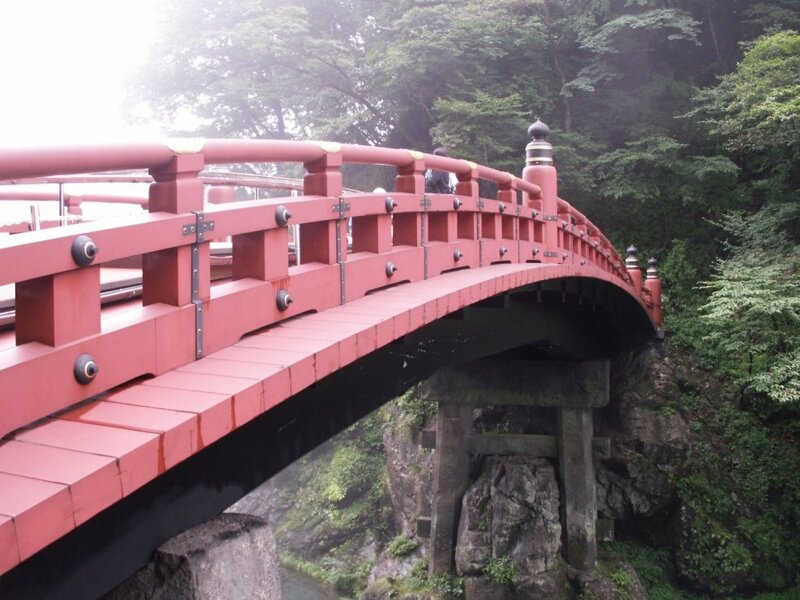 In years gone by, you couldn't walk across this bridge unless you were an emperor. Now, anyone with a few hundred yen can walk across the bridge, or rather the platform about 6" above the bridge. I suppose they don't want anyone scuffing up their multi-million dollar lacquer. finish. The experience of seeing this bridge was quite fascinating, and a bit eerie. The air was full of dragonflies which seemed to almost perfectly compliment the bridge's colors. The other thing that really gave it a neat feel was the combination of creeping mist and clear blue water. The pictures cannot do it justice, but this area was blanketed in clouds and the water was clear enough to see down to the bottom of the river. It was really lovely! More pictures and commentary will follow when I find some extra time.